There’s something great about summer for those of us that are here all year round. Less traffic, shorter lines, greater availability, and oh those summer specials! There’s more room on the beach. But there is so much more to Hollywood than the beach, and really, sometimes, it’s even too hot for even the most intrepid tanner. So, we checked in with some of our in-town insiders and favorite merchants for ideas to help you fill those Lazy Hazy Crazy Days of Summer. And Oh, those summer nights… Tell me more, TELL ME MORE!!! Summer is the perfect time to take that class you’ve been wanting to take. Many of the local universities offer summer school classes to enrich your life in many ways. Parlez vous francais? For people 60 and older, the Elder Grant program, based out of the Fred Lippman Multi-Purpose Center on Polk and Dixie, provides free organized outings and events. For info, call 954 921 3408. Take dance or Karate classes at Young Circle ArtsPark. Info at hollywoodfl.org/301/Programs-Classes or call 954-921-3500. And if you want to learn but just can’t drag yourself out into the heat, just fire up your computer and see what you can learn online from the same educators. If it’s too hot to sit in the sun, stop in at the Community Center in your area. I stopped in at the Center at the beach and found flyers for all kinds of classes and groups for people of all ages. Another place to check for similar activities is the library. There’s a Center in just about every area of town. Support yours and they’ll get even more resources to support you back. Margaritaville Hollywood Beach Resort is the largest provider of ongoing free live musical entertainment of any South Florida hospitality destination, with over 75+ free shows a month, and at least 2 live shows per day. Plus, there are seven bars and restaurants open to the public. Along with the FlowRider, fun to watch and probably to do (if you’re young and strong) there’s entertainment for all, guest or not. What you may not know, though, is that there is a full range of spa and other activities that are available at low, no or discounted prices for locals, including a Free 5K Guided Run on Wednesdays at 5 pm, a variety of yoga and fitness classes — such as Beer Yoga on the private pool deck overlooking the ocean — for just $12 a pop including the beer! — and several spa deals and FlowRider specials for locals only. Click through or contact the Concierge Desk at (954) 874-4444. Plus, there are Florida resident specials for discounted stays — just tell your reservationist or show your FL license upon check-in. For lessons and other information on the resort, visit www.margaritavillehollywoodbeachresort.com or call (954) 842-7907. If you’ve always planned to learn to swim, or you’ve got some kids for whom it’s time, make this the summer. There are low-cost classes at Driftwood Pool, Click here to see a PDF of its brochure. http://fl-hollywood2.civicplus.com/DocumentCenter/View/4072. To register or with questions, call 954 967 4644. Remember, we live in a tourist town, so let’s make sure we’re all getting treated as well as, or better than, the tourists. First thing, get your Hollywood resident parking permit to save money when you park anywhere in the city where you have to pay. Visit https://www.hollywoodfl.org/1043/Resident-Parking-Rate for info and to sign up. If you’re planning a trip to the beach, stop by the visitor info kiosk on Johnson St. and pick up a few of the flyers, chock full of full of local discount coupons. Check money-saving sites like Groupon.com and of course, you can support our advertisers and use coupons in the Hollywood Gazette. An innovate website called charitydine.com combines trying new restaurants, saving money and making a difference for a local non-profit all at the same time. Talk about a win-win-win. And speaking of winning, if you download the Buy Local Win Big app you can enter to win weekly cash and prize giveaways to reward you for shopping local. In addition to the pool, there are always tons of things going on at the Y. For summer, the Hollywood YMCA is offering a free five-day trial membership. You can download their catalog or call them at 954-663-1286 to find out more. Unplug and ‘check out’ one of the public library branches we are lucky enough to have here in Hollywood where they still have actual, physical, books. Inhale nostalgic scents of paper and ink while taking part in one of many discussions and book clubs our public libraries have to offer, all at no cost to you. Hollywood residents Ben and Stacy Ruby operate Wild Lime Tours and they’ll show you the wilder side of the Sunshine State with day trips not far from home and yet a million miles away. Hang out with alligators in the Everglades, snorkel, kayak or paddleboard in the Keys, even take a “Where the Beers Are” Craft Beer tour. And there’s more. The Rubys are offering a 20% discount for locals on all trips. Use code LOCAL123 online or call 954-673-6647 for info. With an impressive collection of only 5-star reviews on their Facebook page, they must be doing something right! There’s always something going on in TY Park, and the beautiful, heavily-treed oasis promises a cool respite from the heat. The Seminole name of this 138.6-acre park, Topeekeegee Yugnee, means “meeting or gathering place,” perfect for a park known for its shady picnic areas, many shelters, and gazebo. interactive water playgrounds: one for smaller children and one for bigger kids. The aquatics complex also includes a marina with boat rentals, a concession stand, and 14 Funbrellas available for rent. Visit Castaway Island or call 954 357 8811 for hours and fees. In addition to Castaway Island, TY Park features a full-hookup RV campground with Wi-Fi, 13 picnic shelters, an abundance of open picnic areas, and a large, open field suitable for a variety of family activities. There is also a two-mile loop of paved pathways for walking, jogging, skating, and biking. Other popular areas include the large shaded playground, basketball and tennis courts, the fishing pier, and the scenic lake water fountain. On any given weekend you may see various cultural and performance groups practicing! But wait, there’s more! Hollywood actually is home to over 35 parks throughout the city. Visit https://www.hollywoodfl.org/316/Parks and find one you haven’t been to, pack a lunch, and have a great new adventure! Whether you’re into hiking, kayaking, bike riding, fishing or just a leisurely stroll, don’t miss the beauty that is so close to home at Anne Kolb Nature Center. Named ‘BEST NATURE CENTER OF THE YEAR 2017’ in a survey of park patrons, the peacefulness is beyond words. It’s the antidote for your most frazzled day. Just go. If you’re feeling a little more adventurous, you can rent canoes, kayaks or longboards, or bring your own, right across the street at West Lake Park. Or just take a break from the beach at North Beach Park, all of which are administered by Broward County Parks and Rec. Ann Kolb Nature Center is located at 751 Sheridan St., Hollywood, FL 33019. For info, call 954-357-5161. Also located in Hollywood Beach and part of the North Beach Park is the Marine Environmental Education Center (MEEC) at the Carpenter House. You’ll learn everything you ever wanted to know and more about sea turtles and coastal ecology. Wonderful for kids and adults. You can go at mealtime and help feed Captain, the in-house rescue turtle. Call 954-357-5125 or visit https://cnso.nova.edu/carpenter-house-meec. Everyone loves a spa day. If you’ve never had one, here’s your chance. On Stirling Road just east of 441, at Sheridan Tech, they don’t just teach mechanics and electronics. There’s a full spa where students will give you facials, haircut and color, even a manicure and pedicure if you time it right. This reporter got her hair bleached one day, and went back for a deep facial peel the following week. Excellent work at a fraction of the cost of going to a commercial spa. We all spend lots of time in the ocean and the pool, but what about what’s happening on the Intracoastal side of town? Well, you don’t need a boat to cruise like a millionaire! The Fort Lauderdale/Hollywood Water Taxi runs up and down the waterway all day and your ticket lets you get on and off as many times as you like. If you’re lucky, you’ll get a chatty guide like Todd who will entertain you with stories of many of the gorgeous mansions and lovely parks you’ll pass along the way. You can buy water, soda and wine on board, and the popcorn is free. Summer specials include half-price monthly passes, happy hours, and senior and groups discounts. 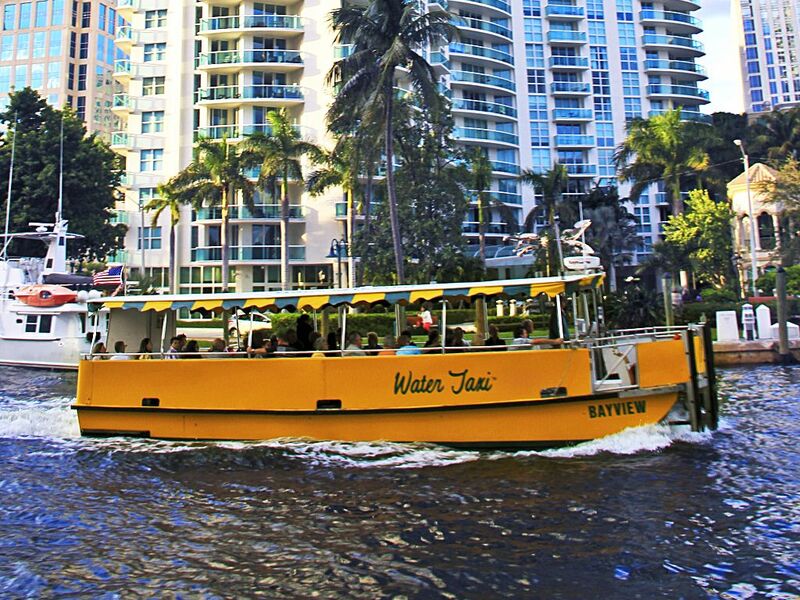 Call 954-467-6677 or visit http://watertaxi.com for schedules, maps, and details. If all this art has awakened your own creativity, there are at least five do-it-yourself arts and crafts studios in Downtown Hollywood where you can go and express yourself. People come from around the world to visit our Seminole Hard Rock Hotel and Casino — you just have to go across town. You may get lucky and win, or you may get lucky and see someone famous! There is nothing like being of service. Try spending a day with someone worse off than you. You’ll forget all about your own worries, aches and pains and problems. And make someone’s world a little brighter. Pick a cause that speaks to you or an activity you enjoy or are good at. There’s always a place where you can make a difference. Their online calendar will show you a place where they can use your valuable help, right here right now! It’ll make your world a little brighter too.